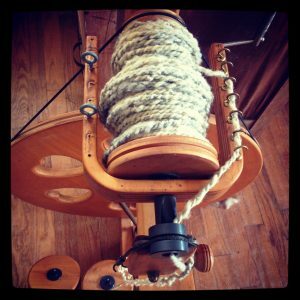 Spinning lessons are taught either on my handmade Louet-inspired single treadle wheel, or my Ashford Country Spinner 2. If you have a finished project in mind to knit, crochet, or weave, feel free to bring along a pattern and we can make sure that the yarn is suitable. 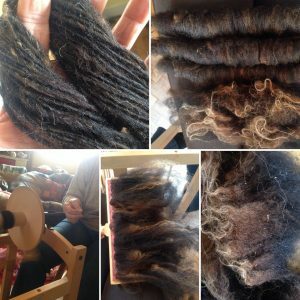 Depending on your experience level, in your class we can cover the basics of spinning, setting up your wheel, spinning worsted vs woolen, spinning singles and plyed yarn, and lockspinning and tailspinning. 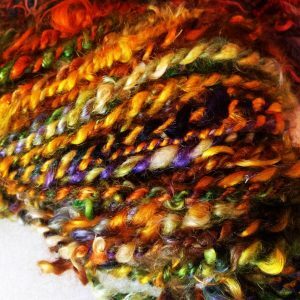 Sometimes a certain type of yarn suits a specific way of spinning, and we can discuss this too. 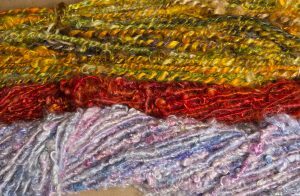 There are many different types of yarns dotted around my studio, so you can decide if there’s a new technique you’d like to try or if a certain type of yarn catches your eye. 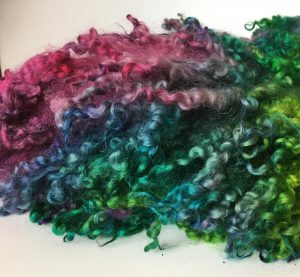 Three hand dyed mohair yarns, all lockspun. 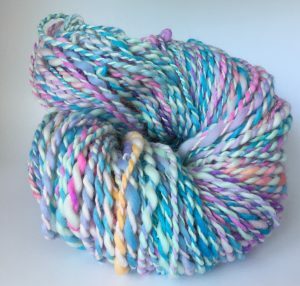 A single ply, hand dyed lockspun mohair yarn. 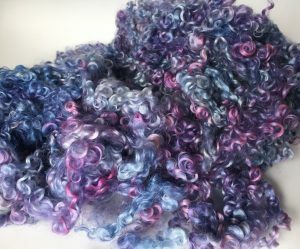 A fractal spun silk, polwarth and merino yarn. 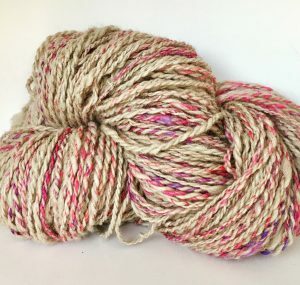 A 2-ply cheviot and alpaca blend spun on my hand made wheel. 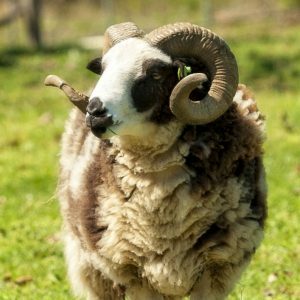 Whether you have a favorite kind of wool you just can’t get enough of, or you want to try something different, I’ve got you covered here. On the farm, you will find Jacob, Navajo Churro, Icelandic, Icelandic x Border Leicester, Jacob x Churro, Icelandic x Jacob, Border Leicester, mini Cheviot and Tunis sheep. 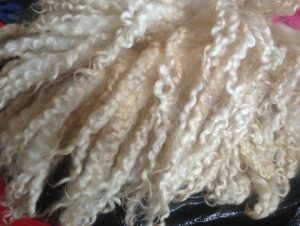 Each wool has its own unique characteristics, and a purpose for which it is just perfect. Try one, try them all. Put a face to the fiber, bury your hands in the fleece, and see which one appeals to you! 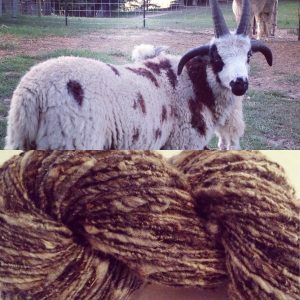 Cheviot: it’s dirty, but that crimp! 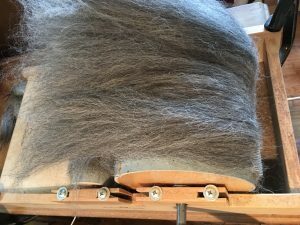 Once you have chosen your fleece, we will barn skirt it as we shear, and I’ll explain my process for shearing and bagging, along with the various parts of the fleece and how they differ. Then, we will lay the whole fleece out and skirt again, leaving us with the prime areas, which will become our yarn. 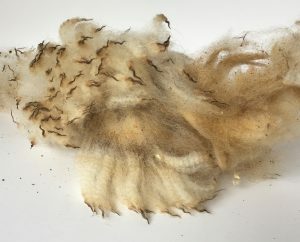 Often, fleeces will benefit from being tumbled, to remove second cuts, some vm and dust. 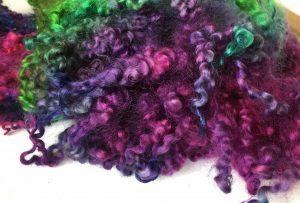 If you are planning on dyeing your fleece, it is likely that we will split your experience into two days, as the fleece will need time to dry. 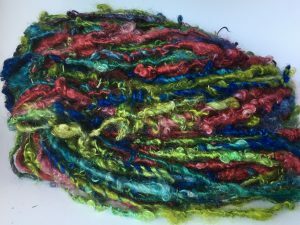 In this case, the carding process will come after the dyeing. 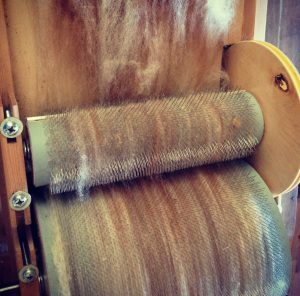 Carding is where we brush the fibers into some kind of order in preparation for spinning; a either a batt made on the drum carder, or rolags made on the hand carders. 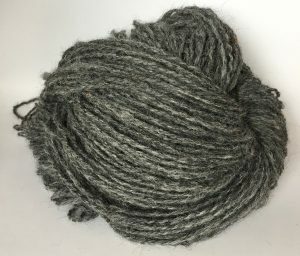 Some fibers can be spun from the cloud with minimal preparation, and we can discuss how this affects spinning techniques and look at some sample yarns. 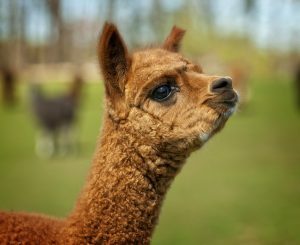 At this stage we can also blend your fleece with some other kind of natural fiber such as wool, mohair or silk, or with some sparkle, such as angelina or firestar. I’m a huge believer in letting a fiber speak for itself, and not processing the character out of it, which is why I avoid milled fibers wherever possible, but I also believe there’s few things in the world can’t be made even better with a little sparkle. Hand dyed mohair rolags prepared on the hand carders. A lock of Navajo Churro fleece sitting on top of a carded batt. Preparing Navajo Churro x Jacob rolags on the hand carders. No matter what your fiber passion, I bet I have a fleece here that will make you smile. 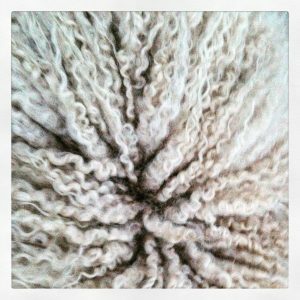 Whether it is wool, mohair or alpaca that makes your fiber artist fingers itch, I invite you to come into my barn to see the beautiful Faces of Fiber hard at work, growing your fleeces. 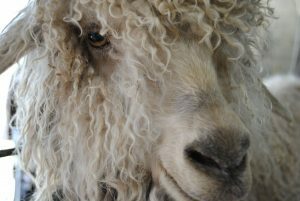 The joy of raw wool over the kind processed commercially at the mill is the handle, the luster, and the natural crimp. It’s truly amazing to me that an animal that sleeps in the woods, rolls in the dust, and bathes in my pond can produce a fleece of such softness and beauty. 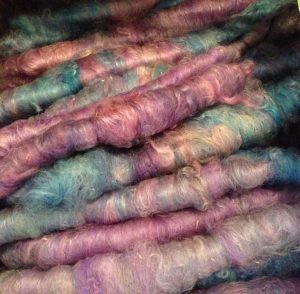 If you’d like to try a new kind of wool or fiber, this is your opportunity! 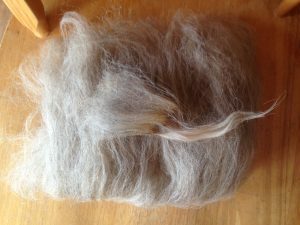 If you are unsure about which kind of fleece suits you best, we can discuss the benefits of one kind of fiber over another for various projects, and find the one that will get you hooked on raw wool. 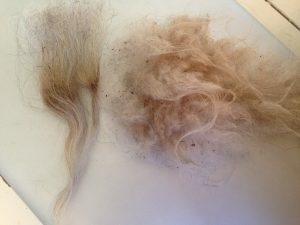 Once you have selected your fleece or fleeces, we will shear it, and I’ll explain the different types of fleece found on the animal, the delights of prime fleece, and why we avoid second cuts. 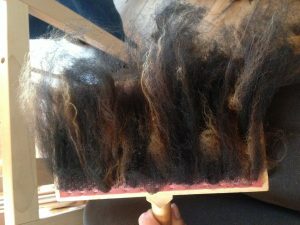 We will barn skirt as we go, and then skirt again when the shearing is complete. Start here: choose your fleece!